The home is the center of our lives. It’s where we unwind, play, work, cook, sleep, and learn. With a simple command or question, Alexa opens up a world of new possibilities in the home. Now with Alexa available on a growing number of devices, and compatible with a wide range of smart home products, it’s possible to enjoy hands-free voice control and cloud-based intelligence in more places than ever before. The magic of the connected home is something that needs to be experienced firsthand, and that’s why we’re hitting the road this summer with a traveling smart home to show off the latest products integrated with Amazon Alexa. It’s called the Smart Life Roadshow, and we can’t wait to see you there! See which stop is near you! Intel and Amazon are working, from device to cloud, to accelerate the smart home of tomorrow, through more intuitive, ambient experiences for customers. Today we introduce the Smart Life Roadshow, a traveling smart home that showcases the latest advances in intelligent voice technology. The roadshow features a 30-foot traveling trailer outfitted with products integrated with the Alexa Voice Service, the Echo Family of Devices including the new Echo Show with Intel-powered technology, and a wide range of Works with Amazon Alexa smart home devices and Intel supporting technology. With innovative brands such as Sonos, Logitech, and ecobee on board, we’ll be touring the US from late July 2017 through the end of January 2018, attending events such as AWS Summit Chicago, CEDIA, AWS re:Invent, Embedded Systems Conference, and CES. The roadshow will also stop at select Amazon Books retail locations, and college campuses including Arizona State University and Oklahoma University. Visitors will receive a guided tour of the trailer, which demonstrates how to build an integrated smart home with Amazon Alexa. The tour features four display areas—a home office, kitchen, product displays, and living room—and runs through a range of voice-forward experiences, from simple, one device interactions to scenes involving multiple products. The trailer features products from Amazon, Intel, HP, Sonos, ecobee, Logitech, Lenovo, HTC, Ford, ASUS, and many more. Connectivity on the road will be provided by and Intel-powered gateway. More Alexa-enabled products, smart home devices, and Alexa skills will be added and demonstrated over the course of the tour. For device makers looking to quickly build Alexa-enabled products, we will also include new Intel Reference Solutions for the Alexa Voice Service at select industry events. Visit the Smart Life Roadshow page to see dates, live videos, and social media updates from the road. What is the Alexa Voice Service? The Alexa Voice Service enables developers to integrate Alexa directly into their products, bringing the convenience of voice control to any connected device. AVS provides developers with a full suite of resources to quickly and easily build Alexa-enabled products, including APIs, hardware development kits, software development kits, and documentation. Through AVS, device makers can add a new intelligent interface to their products and offer customers access to a growing number of Alexa features, smart home integrations, and skills. Just ask, and Alexa will respond instantly. 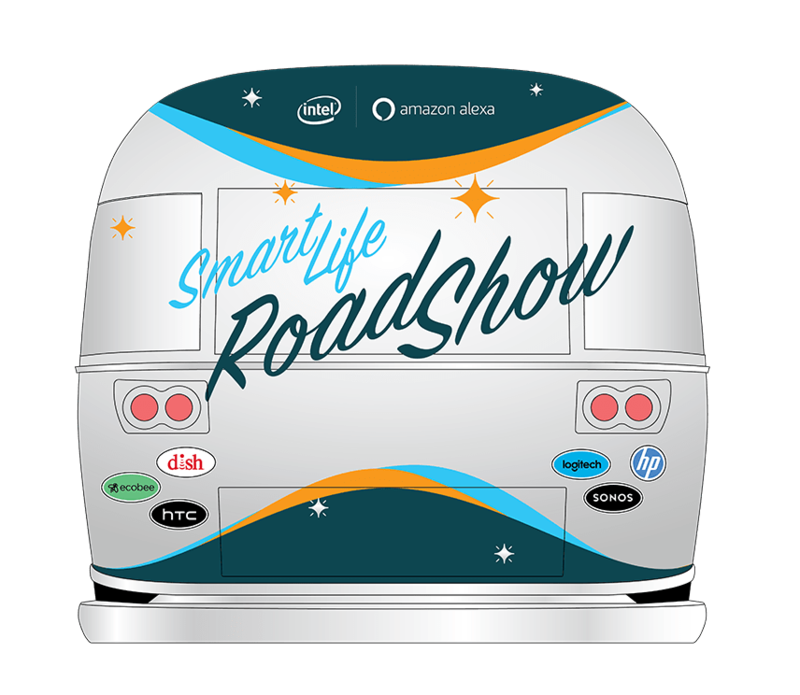 Most of the products featured in the Smart Life Roadshow include an AVS integration and provide customers with access to Alexa, whether at home or on-the-go. Learn more about the Alexa Voice Service on our developer portal. Smart homes go beyond simply connecting things to seamlessly delivering amazing new experiences in the places we live. Intel is accelerating the smart home transformation by providing our customers with the technologies to deliver new and innovative devices such as the new Echo Show and Echo Look.These technologies simplify everyday tasks, enrich daily life, and provide greater peace of mind in the home.